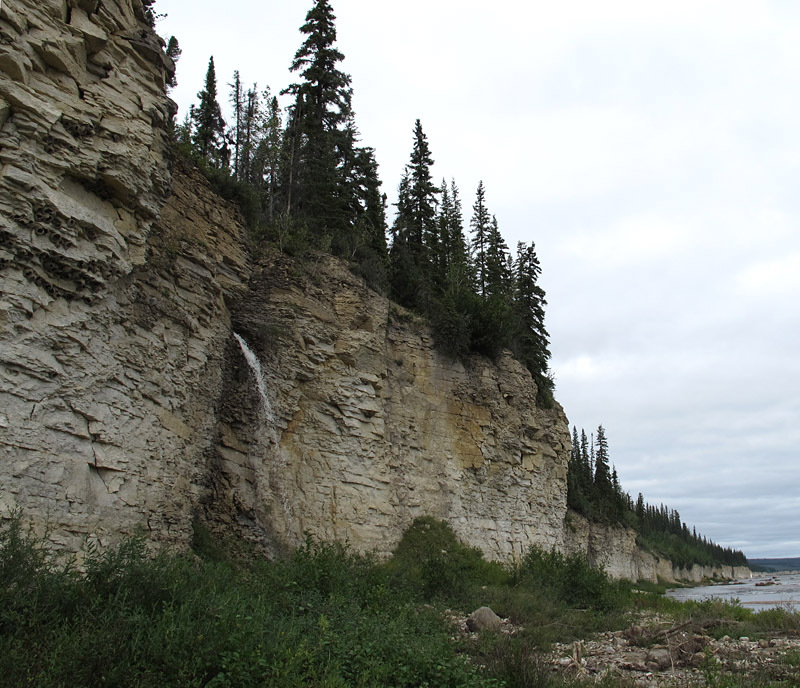 From Portage Chute to Bad Cache Rapids, the entire riverbed is an unconformity. 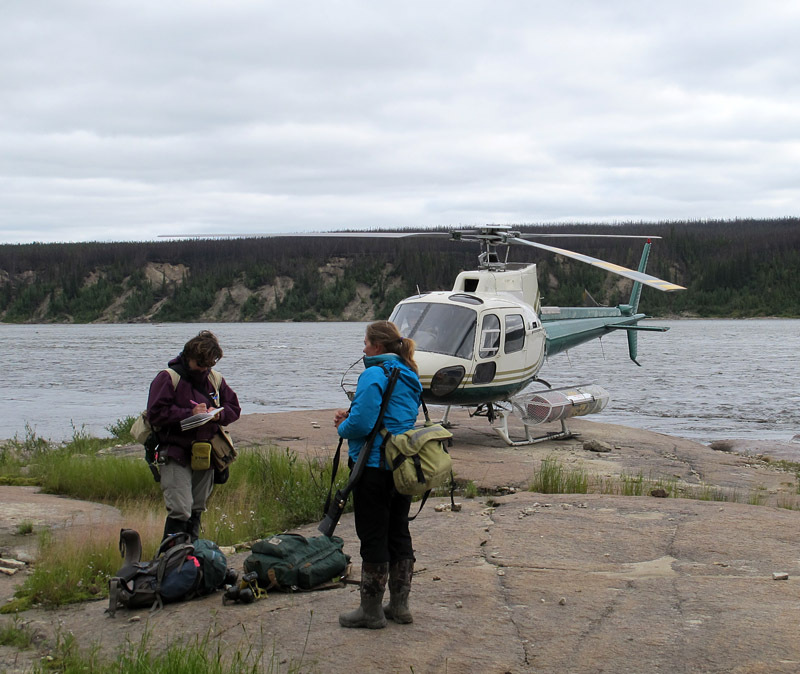 Heading south from Churchill, the helicopter follows the river for the first 30 kilometres above its mouth. Then we head off overland, taking a straight-line shortcut instead of duplicating the river’s long dogleg. “Overland” is, perhaps, a bit of a misnomer, since the surface we pass over must be at least 20 percent open water, with much of the rest consisting of bog and moss, but as far as I know “overtundra” and “overmuskeg” are not words. Anyway, we fly low across this strangely-coloured otherworldly landscape for many kilometres, before rejoining the river’s course. Coming over the steep bank, we can see that the river is still broad, but it is very different from the estuary you see at Churchill. Here the water rushes over its bed, with many treacherous shallows, boulders, and long stretches of rapids. 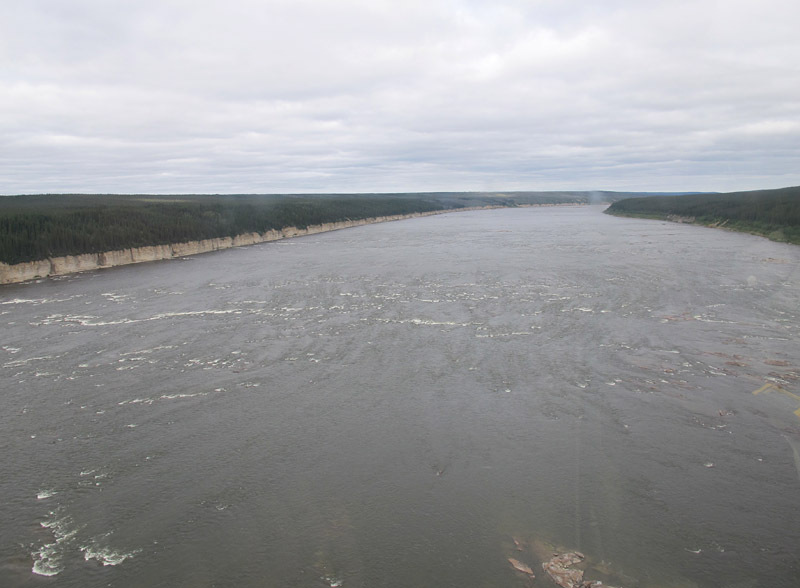 After a stop to survey the cliffs beside Bad Cache Rapids, we are picked up again for the hop to Portage Chute. 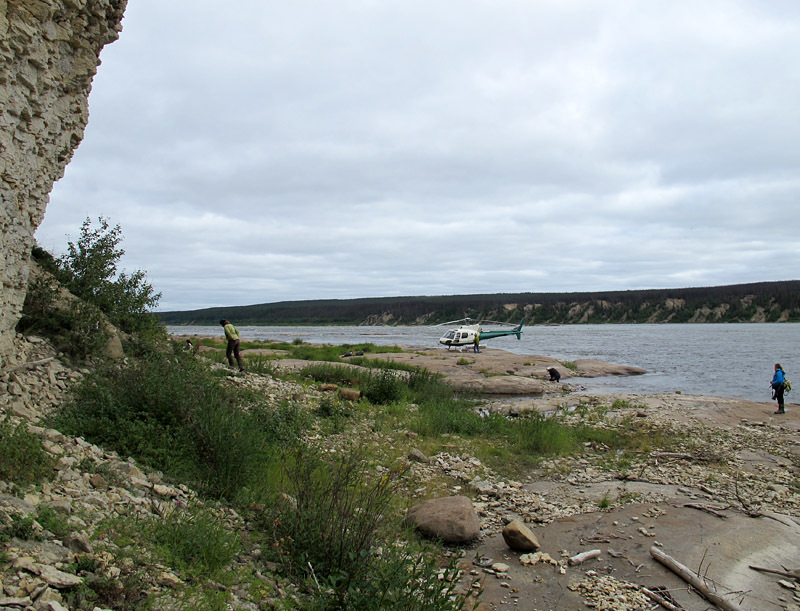 One hundred and twenty-five kilometres from the Town of Churchill, this will be the farthest we go during our several days of helicopter work in August, 2014. Around the steep rapids of Portage Chute we can see no landing place (the name “Portage Chute” apparently means “falls requiring a portage”), but a little way downstream a flat platform of bedrock extends from the cliffs on the river’s northwest bank. It is a perfect natural helicopter landing pad, and Frank quickly sets down. Once he gives us the all clear signal, we pile out and gather the packs, tools, and shotgun (never forget the shotgun, as there is still a risk of meeting polar bears even this far inland). The rapids at Portage Chute are tremendously steep and treacherous. The helicopter landed on the one little patch of dry granite. 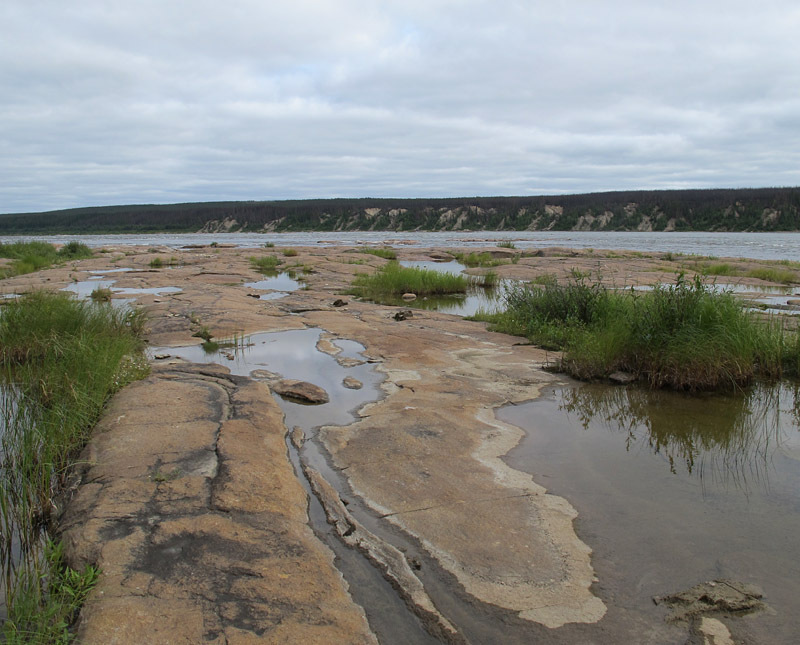 Portage Chute represents the beginning of Ordovician geology for this part of the Hudson Bay Lowland. South and west of here, everything is Precambrian for hundreds to thousands of kilometres. 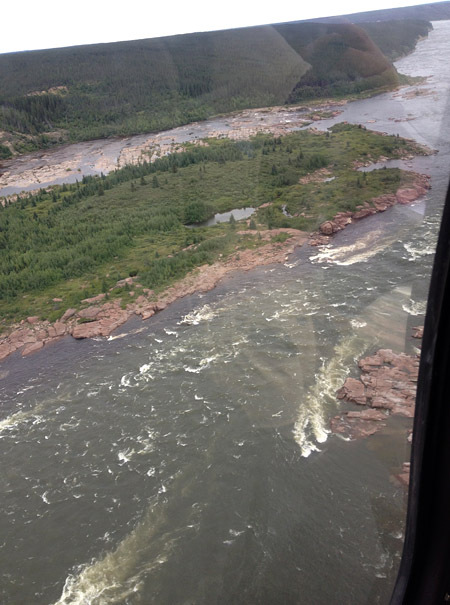 In fact, the granitic rock on which the helicopter rests is Precambrian in age, while the limestone cliffs beside us are Ordovician (Portage Chute Formation, Bad Cache Rapids Group, Katian [Upper Ordovician, in the range of 450 million years old]). We are standing on a great unconformity, one of the most spectacular geological contacts in the world. Our feet are on a surface that was eroded for more than a billion years, starting in a time when there was no complex life on this planet, while our hands can reach out and touch bedrock that was deposited as carbonate sediment on an ancient tropical seafloor during a time when marine life was reaching the peak of its first great diversification. It is a magical place for a geologist, but it is also spectacularly beautiful, and for a few minutes I just stand there drinking it in. Not only is the exposure of the unconformity here almost too wonderful for the average geologist to believe, but it extends as far down river as I can see. 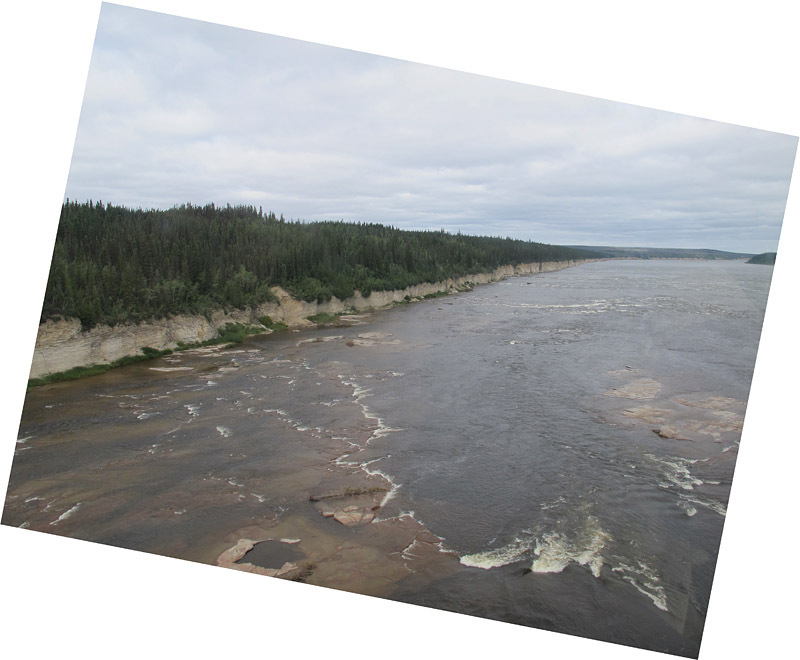 In fact, Precambrian rock makes up the riverbed all the way to Bad Cache Rapids, some 20 kilometres away, while the Ordovician cliffs extend much farther than that! This Precambrian surface had been weathered for more than a billion years by the time the Ordovician rocks were deposited on top. Those Ordovician cliffs are also special for a paleontologist, because their mottled limestones hold wonderful examples of the fossil assemblage that has been sometimes called the “Arctic Ordovician fauna.” This biota includes a great variety of groups, and it is notably defined by receptaculitids, large gastropods such as Maclurina manitobensis, and cephalopods. In just an hour or so on the site, I am able to collect very good examples of all of these, and also corals (Calapoecia, Catenipora, Manipora, Palaeophyllum), brachiopods, and parts of trilobites; a rich haul! The cliff of the Portage Chute Formation. We can’t collect from the face itself due to treacherous loose overhangs, but there are plenty of lovely fossils in the fresh angular scree at its foot. The Arctic Ordovician fauna is widespread in central and northern North America; its best known occurrence is in the Tyndall Stone (Red River Formation, Selkirk Member) quarried at Garson, Manitoba, but it also occurs in places as widespread as New Mexico, Montana, the Canadian Arctic islands, and Greenland. The name “Arctic Ordovician fauna” was proposed by Dr. August Foerste in the 1930s as a shorthand for those Ordovician fossils in central North America that do not belong to the “Richmondian fauna” typical of the Cincinnati Arch area, and the concept was expanded upon by Dr. Sam Nelson in the 1950s. This specimen of the tabulate coral Manipora sp. encloses a few corallites of a rugose coral that may be Palaeophyllum sp. (left of centre; scale bar is in centimetres). Interestingly, Nelson carried out his early field research in 1950-51 along this same river we are visiting today, and his publications list a great variety of fossils from this very site. 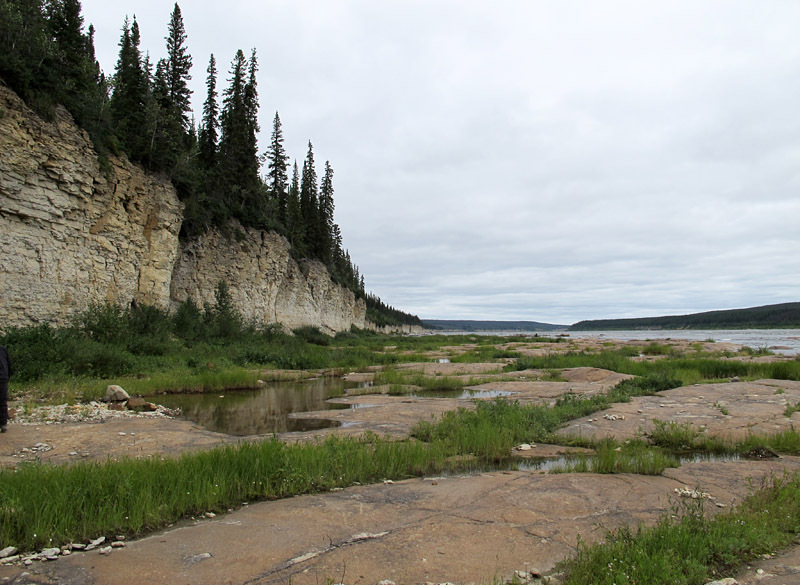 * This place is so inaccessible that I doubt anyone has done serious fossil collecting here since Nelson’s visit more than sixty years ago, which probably explains why there are so many fossils for us to find! With another hour or two working through these scree slopes, I’m sure we could easily equal his total of 46 species from the upper part of the Portage Chute, without even bothering to go down river to other sites such as Bad Cache Rapids. Still, the hour of collecting has given me a very good set of samples to take back to the Manitoba Museum, and perhaps we will return next summer for another visit. 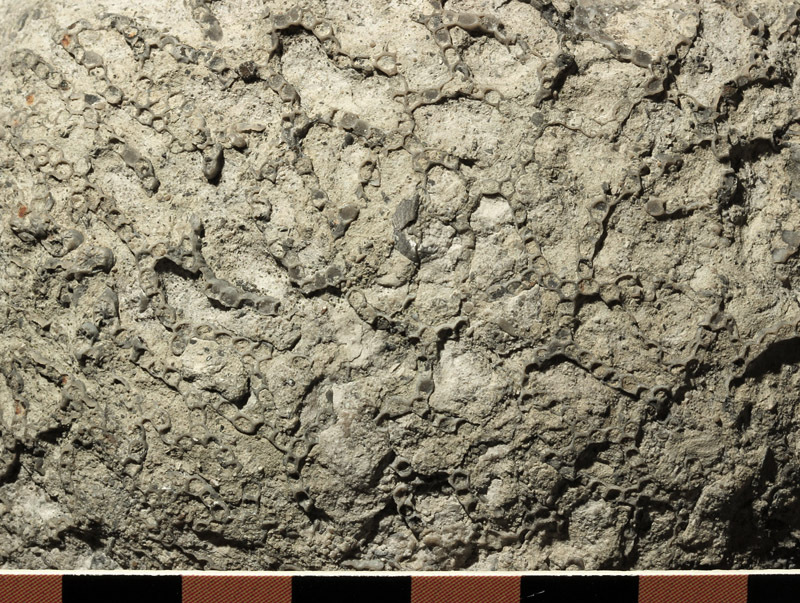 The Ordovician (Katian) limestone of the Portage Chute Formation, Bad Cache Rapids Group, is burrow-mottled and similar in general appearance to the Dog Head and Selkirk members of the Red River Formation in southern Manitoba (the Selkirk Member includes the famous Tyndall Stone). 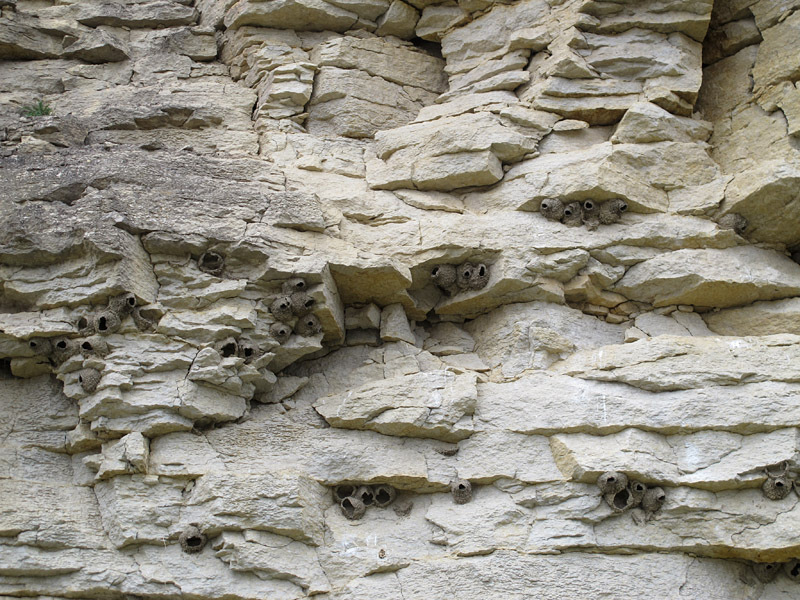 Those are apparently cliff swallow nests under the overhangs; the residents had departed, though, so we couldn’t be sure. Listening to the deep rumble of the water as it rushes past over the rapids, I consider Nelson’s traverse of this river with considerable admiration, since he did the great majority of it by canoe or on foot (he had to walk along this particular stretch of rapids). But now it is time to wrap up my fossils, and get them labelled and bagged before they go into the back of the AStar. Our fieldwork is ridiculously easy by comparison with Nelson’s, and I especially appreciate the padded seat as I nestle in by the window for our return to Churchill, with thoughts toward plans for a shower and a hot meal back at the Churchill Northern Studies Centre. Still, miles to go, and all that tundra, river, and coast to contemplate. Will we see any bears this evening? The road leads ever on. Time to be up in the air and headed for home, with over 100 kilometres of river and tundra between us and Churchill. * See Nelson, S.J., 1963, Ordovician paleontology of the northern Hudson Bay Lowland, Geological Society of America Memoir 90, 152 p.
Another splendid piece – thank you! But once again, Graham, you have engendered a serious case of “outcrop envy.” I have photos taken when we flew over this area – crammed into a considerably smaller helicopter – a few years back, and it was painful not being able to touch down on those hallowed rocks … even for a few minutes. Thanks for taking us on another vicarious geology field trip to a really remote area. Very cool! Many thanks, Kate. It is a vicarious trip for me, too, since it is such a pleasure to revisit the site as I select and edit the photos! Very interesting as always Graham. That’s a charming little waterfall from the cliff face. The exposed precambrian formation is neat. 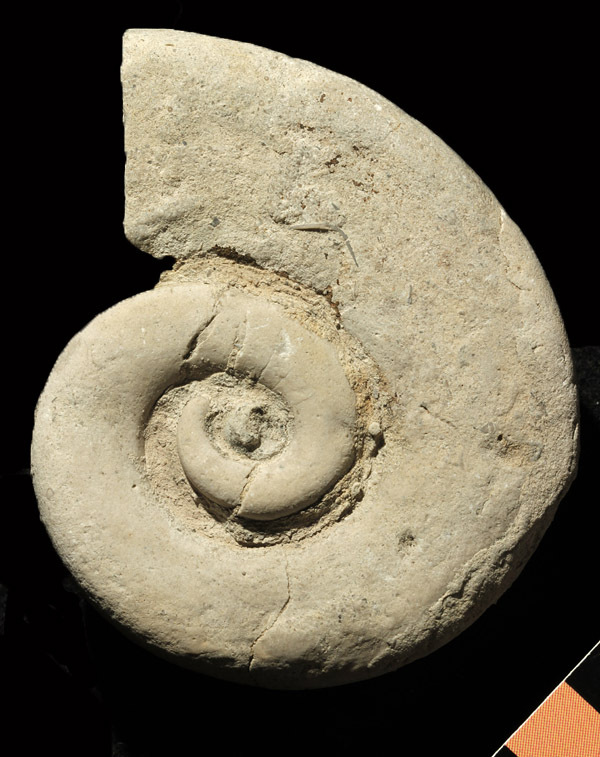 The Maclurina is well formed and much like the ammonites that can be found in other parts of the world. This is a great education. Your fellow paleontologists wish they had been there from the other comments made! Steve, thank you for your comment. I love those pictures. The cliff, or wall, reminds me of some pictures of similar kind of cliffs beside a river and purportedly claimed to be the Siberian traps (also with a similar fall but taller). Daniel, thank you for your comment. the wall is also nice for rock climbing, beautiful overhanging….. Thanks Daniel, I think it might be a little bit loose for climbing – perhaps too interesting!